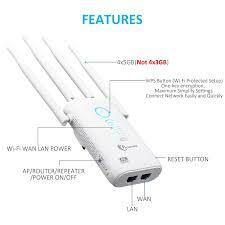 3 in 1 Wifi Extender Booster: Ideal for extending WiFi to devices like iPhone, iPad, Android devices, Echo/Alexa devices, Smart TV, Multimedia player, PC, Mac, Samsung, PlayStation, Smart Plug and etc,. No More Dead Zones: Equipped with 4 x 5DBi external Antennas to extend the range of your wireless router, boost your existing Wi-Fi signal, and eliminate dead spots for improved coverage. Simultaneous dual band: Dual-Band technology enables blazing-fast Wi-Fi speeds of up to 867(5GHz)Mbps + 300(2.4GHz)Mbps connections for 1167Mbps of total available bandwidth; Built-in high power amplifiers to provide extreme Wi-Fi coverage and penetration. With 3 connection mode: Repeater Mode, AP Mode, and Router Mode. Repeater Mode is for extending WiFi coverage of an existing wireless network. AP Mode is for covering a wired network to a wireless network. Router Mode is for creating an instant private wireless network and enable multiple devices to share it. Media Bridge Function: While boosting your existing Wi-Fi coverage, Also equipped with two gigabit Ethernet ports to connect any wired devices such as a smart TV, multimedia player, game console or PC to your WiFi network, work as a media bridge.Repeater Mode, AP Mode, and Router Mode. Repeater Mode is for extending WiFi coverage of an existing wireless network. AP Mode is for covering a wired network to a wireless network. Router Mode is for creating an instant private wireless network and enable multiple devices to share it.